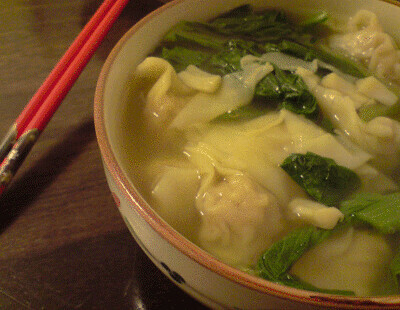 The wonton soup base is usually a lightly flavoured broth or consomme. A well made one can enhance the flavour of the entire dish. Learn how to with these tips and recipes. This article is about the soup base. Tips on making it with a couple of recipes. If you are looking for instructions on making the wontons, you can find more information at my article on wontons. My favourite way is to have it in soup. The soup should not be too strongly flavored because it shouldn't "steal" the spotlight from the main star. They should not fight with the wontons for attention. They are like faithful sidekicks. Take note of these 2 tips when making wonton soup. I said this before, but it bears repeating here - Do not cook wontons in the soup it is going to be served in. Prepare the soup and the wontons separately. Put them together when you are ready to serve. Do a taste-test too to see if you need to add any more salt. Make sure you parboil your meat ingredients like lean pork and pork bones. Whenever meat or bones is boiled, scum will appear and "dirty" the soup. Not just floating bits but the soup will be murky. This can be prevented by first boiling the meat and bones separately. Remove and then rinse to clean off any scum before adding it to the actual soup. Right, let's begin your wonton adventure by making a batch of wonton soup with these 3 recipes. This first recipe is a basic one with pork bones, lean pork and dried shrimps. 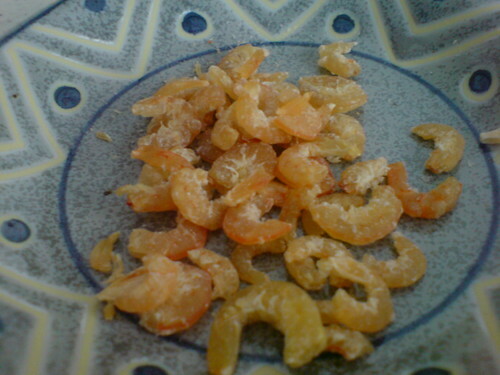 Dried shrimps 虾米 (xia mi) is a simple way to add some ocean sweetness to the soup. Below is a picture of it. Purchase here. This second recipe has one additional ingredient besides dried shrimp. Salted fish or 咸鱼 (xian yu). This is a type of preserved fish using salt. It creates a more nuanced flavour. The last recipe uses dried flat fish 扁鱼干 (bian yu gan). It is also a preserved fish made from small flounders but it is not as salty as salted fish and probably less fishy. This is a popular ingredient with the Cantonese. All 3 recipes can be made using a slow cooker or a rice cooker on congee setting. Set up your slow cooker or rice cooker. You can let your cooker heat up the soup or use boiling water to shorten the cooking time. In any case, place all ingredients into the pot and add boiling water in the specified amount. Take note that the rice cooker has a higher cooking temperature than the slow cooker. So, it should take less time. Finally, if you are not going to use the soup immediately after making them, they can be frozen and stored for later use. It is okay if you think making your own wonton soup is too much trouble. You already have to make the filling and wrap the wontons. You can always fall back on using ready-made soup ones or stock cubes. Do not worry about it. Just enjoy the cooking process. I would rather you make some wontons than not try because you think the soup is too hard. Remember to add a few stalks of bok choy or choy sum to the soup. It makes a whole lot of difference.